First, I would like to mention on their rules and regulations whereby safety rule is important while working. Before assigning real task, they are willing to repeat over and over again just to make things right until I fully understand the proper way to get the job done!!! Finally, I have a great lunch with people from different department (HR). Thanks to Ng Qing Song, Low Heng Hao, Bryan Lee Ming Tian for the advices. 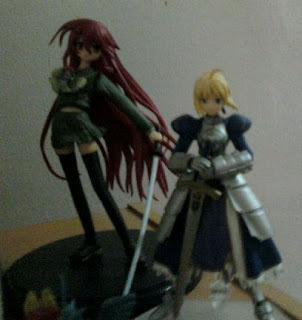 Haha, saber and shana are the warriors that i admire so far. They are pretty skillful in their battle. Saber is also known as 'king arthur' but why the author would have named a girl as a king????? It's weird but people still like her though especially with her bright excalibur sword. Shana is the only red hair warrior girl i saw so far along with her katana. She may seems to be an ordinary school girl. When battling, she can burn her enemy easily in a single blow hit. Do these warriors really exist or just an ideal thinking from the author????? If they are real, this world may be turn up into chaos though they are just female warriors. Is there perfection in life?? How much do you know about perfection?? Do you interested in becoming a perfectionist?? Let me tell u about what is perfect in this world. First of all, what do you want to seek?? TOP TOP TOP IN ACADEMIC?? Well, if you have a dream, dont day dreaming. If you want to be confident, just be yourself. If you want perfect in gaming, go ahead and play for 24 hours and you will be BEYOND GODLIKE!! If you want perfect academic, just put that effort on. If you want to have perfect partner, be brave a bit and confess to your partner. ALL the harvest you get will be perfect as long as you satisfy for what you have done. you will find that you are becoming more and more perfect to yourself. Join in this college after National Service. It was the month of March. At first, we were strangers to each other. As time passes, we start to get closer to know each other. During the whole course in this college, there are friends who actually did their foundations here but they quit to pursue their studies in other college. So sad to have friends departed when we only know for 2 months. However, I continue my foundation programme until the end. During the journey to our external exam on the November 2008, i am glad to have friends to share fun with me together. Almost every week, we hang out together at the cyber cafes and watch movie at sunway pyramid on Friday. I really enjoy the moment together. What actually bring us to know each other deeper? Though it was quite boring, we manage to keep up a good job in our project especially for the Christmas event held for the underprivileged children. In that project, we really put quite a lot of effort that I couldnt describe. However, everything turns well and the kids really enjoy their fun together with us and of course out very special VIP, the director of our foundation programme. I really appreciate the teamwork and fun together with all my friends. It will remain as my memory. 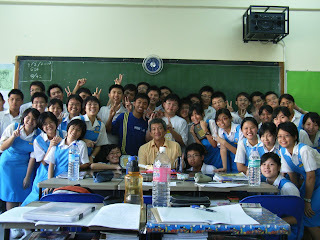 This is the picture of my secondary school class. We are the 5S4. Hehe!!!!! We have been together for 2 years though. We share a very close bond together. Even for the teachers, they are very touched by us during the graduation day in secondary. Fun and sadness we have overcomed together will never changed in our memory.